Complete your look with this cute woven metallic pod by Olga Berg! In a subtle sheen, it features a curved pod shape and black hardware to compliment the overall design. Finished with an optional charcoal chain drop, you’ll want to hire this for an upcoming night out with the girls or party! 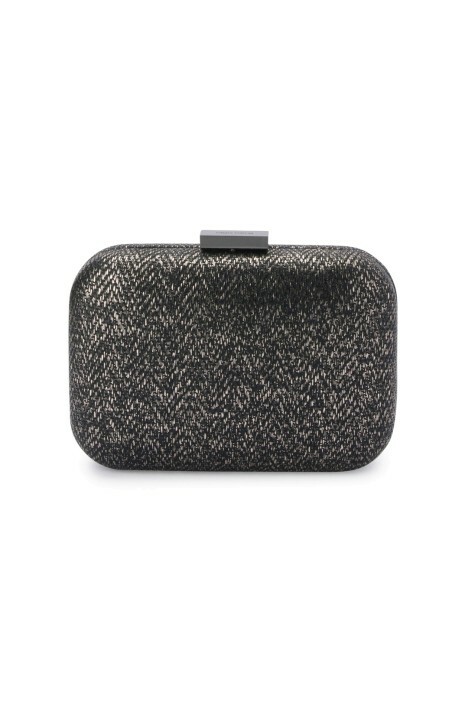 Style this black clutch with a little black dress or a dark floral playsuit available for rent for a playful look. Pop hair in relaxed curls and keep makeup fierce with a winged liner. Read our blog post on how to wear a playsuit for more styling tips. Ana Woven Metallic Pod - Black is rated 5.0 out of 5 by 1. Rated 5 out of 5 by Mary from Lovely bag for a wedding I rented this bag with my Thurley dress which was on point. Everything about GC is 5*. Well done team.